Looking to increase the power in your 1993 Ford Mustang Cobra 5.0L? Check out this Pro-M Mass Air Meter for 24lb injectors & cold air kit! Upgrade your stock mass air meter on your Fox with a 1989-1993 Mustang Pro-M mass air meter! This Pro-M mass air meter features a massive 75mm tube that allows you to really open up your engines air intake! When installing a larger mass air meter on your car you are allowing more air to enter your engine. This helps produce more horsepower and an increase in throttle response by the sensor relaying a message to your computer that more air is coming in. This allows more fuel to be added to maintain the proper air to fuel ratio. 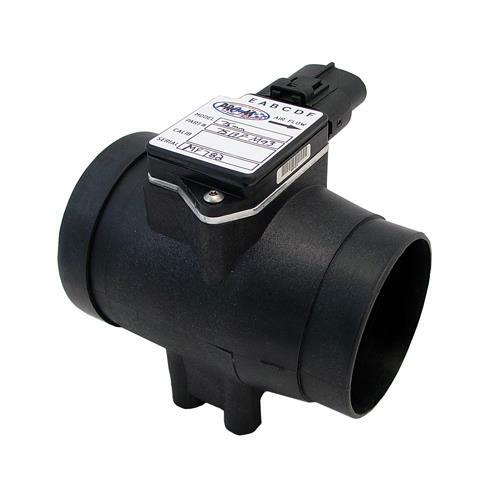 This Pro-M mass air meter comes with factory connections allowing for a quick and easy installation! Your Mass Air Meter is the single most important part in your engine management system. Buy a Pro-M and get the best your money can buy! Every Pro-M Mass Air Meter is custom calibrated to your specific application, and is held to a tolerance 3 times tighter than the OEM meters, and 5 times tighter than the competition! An accurate signal is vital to both performance and drivability. Your new Pro-M Mass Air Meter is shipped to you with a Flow Data Sheet that was generated by your mass air meter on one of our flow benches. This flow sheet verifies that your new Pro-M Mass Air Meter was not only properly calibrated, but also functioning properly just minutes before it was boxed and shipped from our facility. This virtually eliminates the possibility of receiving a defective part. No one else does this! Every Pro-M meter is shipped with the proper connector for your application. No sloppy extension harnesses. Pro-M Mass Air Meters designed for use with cold air kits include a cold air screen. This screen greatly improves airflow and signal quality by straightening the turbulent air created by the elbow on the inlet of the Mass Air Meter. Laminar flow equals more flow and better signal quality resulting in more horsepower and superior drivability. No one else does this! This Pro-M mass air flow meter does not come with a CARB OE number for California residents. Pro-M Racing was founded in 1989 by Bob Atwood, a Ford engineer who was instrumental in pioneering mass air technology. Pro-M quickly became the most respected name in the industry, offering the only real practical solution to the restrictive production mass air meters found in most of today's production Mustangs. We manufacture mass air meters in various sizes, shapes, and styles, as both direct bolt-in replacements, and in universal designs, to maximize your engine's horsepower potential, by allowing your engine to breathe to its fullest potential. Each mass air meter is individually calibrated specifically for you Mustang or Lighting application on one of our in-house flow benches specific to your particular application, and fuel injector size, eliminating the need for time consuming and expensive dyno tuning. Others make claims, but only Pro-M Racing possesses both the intellectual and physical properties necessary to calibrate your mass air meter to within two percent of what the OEM considers the perfect baseline.